Below are some impressions and thoughts shared with us by some of our parents. I have already recommended the Child Enrichment Center to all my family members and friends because it’s so rare to find a a school that plays to each child’s needs and helps him develop to his personal potential. Thank G-d, I feel so blessed to have been able to start my daughter’s education in such a loving and caring environment that has managed to bring out so much of her potential and growth. I only wish there was more room to enroll all kids! This early childhood program offers my children a unique experience to explore, and gain knowledge in areas of secular and Judaic education that is taught through songs, prayers, creative play, structured play, and guidance from teachers and classmates. From day to day, I hear Lev singing new songs in Hebrew and reading new letters. From week to week, Simone teaches me about the Parsha and demonstrates improved reading skills. Furthermore the teachers are great. They show they care and love what they do. The Child Enrichment Center has everything a parent wants and a child needs in one package: love, structure, academic excellent and health consciousness. My favorite thing about the preschool is its warm environment. It really does feel like a close knit family. The teachers are so loving towards the children and my child is always so excited to go to school every morning. And I know that when they leave the preschool they are extremely well prepared for first grade! I would recommend the Child Enrichment Center to a family member or friend because my children feel so at home while learning and playing every day. My child feel so at home while learning and playing every day. My child loves coming to school every day because he loves his Morahs and his friends. My favorite thing about the preschool is how much my kids learn about Torah and how quickly they learn to read. My child loves to coming to school every day because she sees her friends and loves to learn new lessons. I love everything about the preschool. The teachers are amazing and my kids love their classes, asking to come even on Sundays! My favorite thing about the preschool is the lessons my child is learning. I am so impressed with the different educational activities she is exposed to every day. The staff at the Child Enrichment Center is one of a kind! My child is absorbing so much knwoledge year after year, more than I imagined possible. My child looks forward to teh lessons, the teachers, the trips – and of course, show and tell! My favorite thing about the preschool is the individualized attention adn love the teachers and staff give to teach student. They really try to understand my children and their specific needs and abilities. I’ve seen my children grow in all aspects since they started here. The Child Enrichment Center is the most incredible Montessori Program out there. After three kids completing the program, I can vouch for it! My daughter loves coming to school each day because she has the most attentive and caring teachers who make her feel so special. My favorite thing about the preschool is the close knit family feeling you get from the staff, teachers and parents. 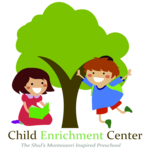 The Child Enrichment Center is a great environment for learning and growth of a child. Everyone is so warm and caring. The teachers are great at teaching while creating a loving environment. My daughter loves coming to school each day to play with her friends and learn new things. The one-on-one guidance at the Child Enrichment Center enables each child to get an individualized parallel program based on their level. The teachers are warm and the classroom is a very loving environment. My favorite thing about the preschool is seeing my children’s happy face at the end of the day.